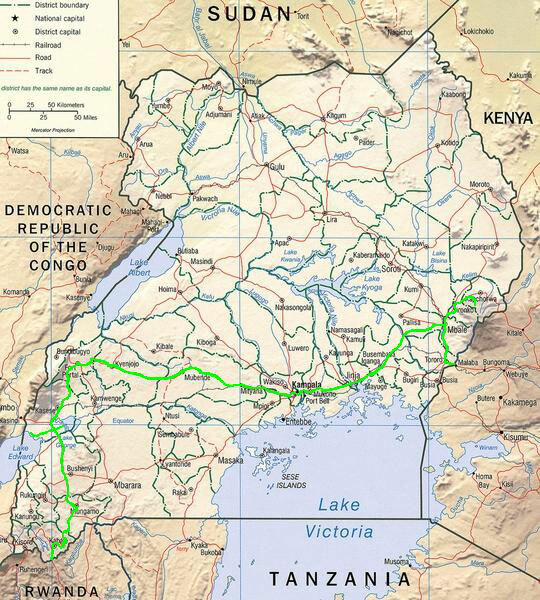 1,113 km of cycling - as part of a bicycle world trip - from the Kenyan border northwards to the Sipi Falls at Mount Elgon, southwestwards to the source of the Nile River at Lake Victoria and to the capital Kampala, then close to the border with Congo southwards to Queen Elizabeth National Park, to Lake Edward and further south to the border with Rwanda. Do you like Cycling Uganda? Having crossed the border from Kenya we stepped deeper into sub-Saharan Africa's inland. Everything seemed to be a little different, the people were even more open and laughing, the traffic was a bit less and it got even more kids waving and shouting "muzungu" (white person). Compared to India the African food appeared to be rather poor, particularly since in India I had decided, to be vegetarian from now on. Well, at least for about 90%... The meals consisted, if not of chips, of rice, maniok and matoke (a kind of mashed cooked bananas with the taste of mashed potatoes). We head north to Sipi-Falls at Mount Elgon, before turning southwest for Uganda's capital Kampala. But 80 km before reaching it, my LX crank decided to give up its life. After more than 35,000 km it was worn out and got loose. The next stop to get spares would have been probably South Africa, reparing was hopeless if not impossible, so there was nothing else left but getting a terribly old and used Shimano crank with suitable blades. There was just one problem from that day on: the smallest blade was significantly bigger than the one I had had before, so the range of gears when ascending was everything but perfect. But at least I was able to go on, so therefore I had been lucky once again. Having got a glimpse at the not that particularly spectacular source of the Nile, the world's mightiest river, at Lake Victoria, Africa's biggest lake, we arrived in nearby Kampala. Actually there was very little to see except of a terrible daily traffic jam in downtown. Therefore we were quite happy to leave that place after Hugo finally got his awfully expensive Rwanda visa (I as a German didn't need one... :-)). Up and down we cycled across endless hills through tropical forest and banana plantations westwards to Fort Portal close to the Congo border. From here we followed the Rwenzori Mountain Range south. Once again we crossed the equator before reaching Queen Elizabeth National Park. After weeks of cycling through and across green hills and mountains we finally found ourselves in typical African savanna. We passed large numbers of antelopes while riding on a bumpy track towards Lake George, where we were hoping to find hippos in the waters. And we did! But, so we were told, they would come out of the water just at nighttime, when they were so dangerous, that even the locals in the small and simple lakeside village would stay in their cob walled huts. Therefore we wisely kept a safe distance to the hippos as well as to the herds of curious kids, when camping right in the middle of the park, surrounded by nothing but the wildlife's nocturnal noises. 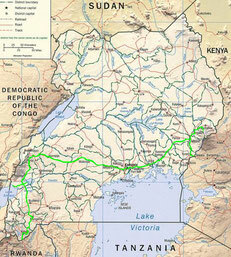 Next day we moved to the park's western part to Lake Edward close to the Congo border. It was on this bumpy washboard road when it surprisingly happened: a herd of wild elephants right next to us and even more incredible: a lion! I came just a couple of seconds too late to get a sight of him, but Hugo was sure of having seen this amazing animal! I was not sure about being disappointed that I hadn't seen him or rather being happy that he was gone, since it was not particularly funny to be on a bicycle close to a lion. (Un-)fortunately he didn't come back, so we kept on going and passed the park's main entrance gate, where it was required to pay a hefty entrance fee for passing through. We were not keen on that, so we followed a road that probably rarely had seen any tourist, when the incredible suddenly happened: right in front of us, just a couple of metres away from Hugo, who luckily had stopped right in time, a huge herd of wild elephants started to cross the road in their usual slow-going pace. Totally quiet and avoiding any unnecessary movement we watched the seemingly endless parade of big and small elephants passing by. It took more than half an hour before this fairly dangerous but so amazing show was over. We carefully went on when just a couple of minutes later incredibly a second smaller herd crossed the road and stopped beside it. When carefully passing it, I couldn't resist to stop and to make a close-up picture. Having spent one night in a very simple lakeside village at Lake Edward, where once again hundreds of kids followed us on our walk through town, we went back to the main road, before heading further south, where somewhere on one of the countless ascents I had then cycled a quarter of a million metres in altitude on this trip. Three days later the pure Africa time in Uganda was over and near Kabale we crossed the border to Rwanda.